In the deep of the majestic Jostedalsbreen glacier, ice caves that will provide the most seasoned hiker with a happy shock are concealed. But unlike most glacier tours, they’re only accessible outside the summer season. Glaciers cover nearly one percent of Norway’s elongated land mass. Among the country’s several thousand glaciers, Jostedalsbreen – the largest in continental Europe – stretches over four municipalities and cover almost 500 square kilometres. But did you know that a strange and beautiful universe is hidden below all the tonnes of ice, where the light, the sounds and the sight of elements shaping the landscape is revealed? The main season for glacier hiking is in the summer. On Jostedalsbreen and in the surrounding mountains of Jotunheimen alone, more than 13 000 visitors join tours and courses, with more than 25 guides working in the area in July and August. Winter, however, is the only season offering the possibility of experiencing the blue ice caves located at the foot of one of Jostedalsbreens close to 50 arms, Nigardsbreen. In the “ice cathedral” or “blue lagoon”, as this environment has been nicknamed, the ice landscape changes from year to year, with old caves disappearing and new ones being born. 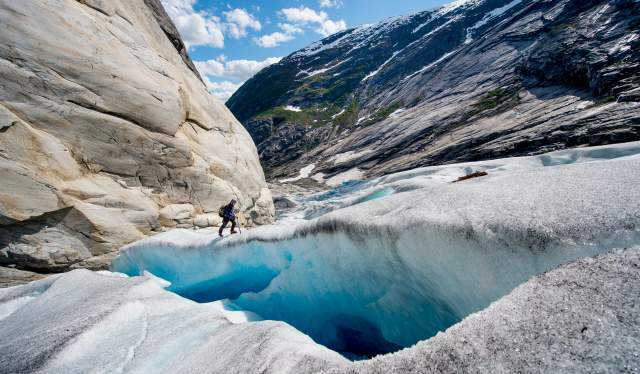 The Norwegian broadcaster NRK recently tagged along on one of the expeditions into the heart of Nigardsbreen. An elderly Dutch couple and a young French couple got to witness the icy wonder first-hand, steadily guided by Newzealander Ben Forster. “The glacier moves all the time, så each cave is unique. Entering one of these caves is truly amazing”, the guide says to NRK. After several hours of hiking on skis or snowshoes, the sensation of being surrounded by ice is something else. “This is incredible, I’m almost lost for words. It was really worth the ordeal of getting here”, tourist Gijsbert Dijkdrenth tells NRK as he finally arrives in the cave. 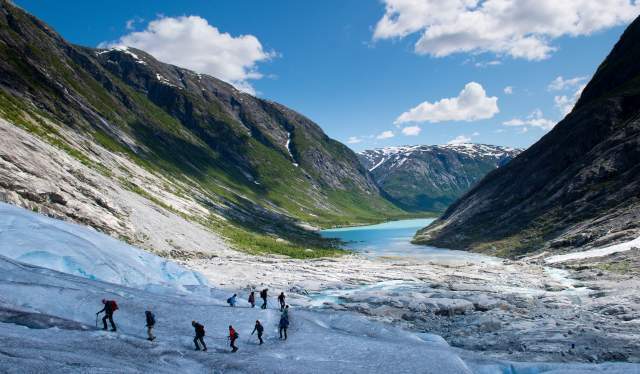 Glacier hiking is a popular phenomenon in Norway, and both the Norwegian Trekking Association and local branches of hikers arrange a number of excursions and courses all over the country. On several of the glaciers, among them Tystigbreen and Folgefonna, skiing through the amazing surroundings while dressed in shorts is an option. One thing in particular is important as you traverse glaciers, though: Never walk alone, even if you’re an experienced hiker. Safe and proper equipment is a must as well, and in many cases, the hike is easily combined with a useful glacier course as well. 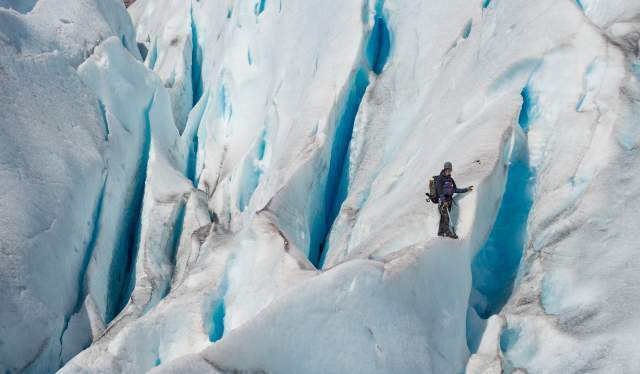 In the company of local and experienced guides, however, hiking across – and below – glaciers is a safe activity. Read more about the different paths to an unforgettable Norwegian glacier experience here, and have a great trip! Hiking in the mountains, walking on glaciers, river rafting, and summer skiing are activities you can participate in whilst visiting the Jotunheimen national park. Here, you can reach the top of Northern Europe’s highest mountain Galdhøpiggen, hike from cabin to cabin, or find a nice spot to set up your tent.